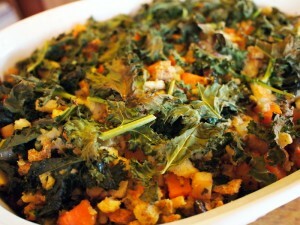 This is a modified version of the vegetarian stuffing that James’ Mom, Eleanor, made this year for Thanksgiving. The original version is available at www.Greatist.com. In a large skillet, heat olive oil and saute celery, onion, and garlic until fragrant, about 2 minutes. Add squash and turnips to the saute and continue to cook until the squash begins to become tender, about 5 minutes. Add kale to the top of the saute and cover the pot. Lower heat to medium until the kale wilts, about three minutes, then remove from heat. Season with salt and pepper to taste. Prepare the stuffing by mixing breadcrumbs and chestnuts in the bottom of a large baking dish. Season with salt and pepper to taste. Add the vegetable saute to the top of the breadcrumb mixture. In a medium bowl, combine vegetable stock with eggs (or egg substitute equivalent), and Italian seasoning blend. When the eggs are thoroughly combined pour the mixture over the stuffing. Place the stuffing in the oven and bake at 350 degrees Fahrenheit for 30 minutes.